I have been very happy with my EERO system as one that bought the system (3 units) via the crowd funding stage, and referred to 4 more house holds for same. I also recently added a beacon to my system to further increase coverage to my bedroom. However, over the last few days, I am having some intermittent internet connectivity problems. When I unplugged and re-plugged the unit connecting to the internet to reset, I get that the top of the unit was relatively hot (like a computer running for a while), and the bottom of the unit is very hot (burning) to my hand. Is the normal? Do I have a defective unit? Its only been 2 years! Please let me know if anyone experienced the same? Thanks for reaching out. I see that a member of our team is currently helping you through this matter. Thanks for your patience and understanding. Jeff C. The tech support asked me for the usual questions, like where is unit placed, is it under the sun, covered by stuff, next to a wifi router, etc... I provided my answers. The unit is sitting on my desk, with no obstructions, and not under the sun. It is the unit connecting directly to the cable modem. I also attached a small switch hub so that I can connect to other local storage devices. Other eero units are only warm to my hand. I have another 2 reboots today. Jeff C. hello I’m having the same issue these systems are very costly and I was so afraid that I hurry and unplugged it it burnt me fingers that’s hot hot it got ! Chany1 Hi Chaney, Isaac with support here. We reached out to you directly so we can get you taken care of. Please respond at your earliest convenience. Thank you! I’m having the same issue. The hard wired unit just over heated and I had to unplug it to cool it down. It was so hot it felt like it could burn skin. I’m a little concerned about it being a fire risk—plus it is a little frustrating to spend 400 and then have connectivity issues. Any suggestions? Is there a recall? Thanks for reaching out. Like most electronics, eeros can get warm when running. Anything outside of that isn’t typical, and we’d be happy to take a look and provide any next steps including a replacement if necessary. If you haven’t yet, please contact our support team so they can take a look. We can be reached by email at support@eero.com or by phone at (877) 659-2347. I have the same problem. Main Eero of the 3 eero unit is extremely overheating. Has there been any update? Less than 8 months old. Thanks for reaching out. As mentioned above, like most electronics, eeros can get warm while running. We often compare it to a laptop that is on. Anything outside of that type of experience isn't typical, and we'd suggest taking a few precautionary steps, followed by reaching out. First and foremost, please make sure the eero isn't in a contained space. If the eero is placed in a closet or cabinet, it is best to move it to a place that is more open. In addition to that, please also make sure the eero isn't being covered by any objects. If the experience remains after following these steps, or you already were following these best practices, please send us a note at support@eero.com so a member of our team can take a look. I am still having the same issue. The connectivity can be intermittent when it exhibits over heating. I am hoping either I can get a replacement or some software upgrade to solve the problem. They get hot - too hot in my opinion, regardless of what Eero says. Especially the gateway unit when there's a lot of activity. Most other routers have significant numbers of ventilation holes. Multy X uses a really nice quality white plastic with tons of holes in it, looks really attractive, and it never got more than lukewarm for me despite similar hardware, the whole time I used it before Eero. Not sure why Eero doesn't do something similar. Sometimes my speeds are very erratic and I tend to believe the heat might be a contributing factor. I just put a small USB fan next to it to blow on it, and plugged it into a nearby device with USB ports. Steve1963 I had to put a fan on mine too. The bottom of the device is extremely hot while the top is much warmer than it should be in my opinion. The gateway and 2 beacons have completely fixed all of the issues I was previously having but I just hope the gateway doesn't give out because of the continuous extreme temps. I am having the same problem. My unit is about a year old and I started having connection problems. When I went to unplug the unit to reboot it the bottom was extremely hot. It’s out in the open, on a solid surface and out of sunlight. Has anyone had a solution to this? I too am worried about a fire hazard. We were doing some work at the house so I unplugged an extension eero (not the base at the router) and was surprised how hot it was. I'm not sure about the others. So this is related to usage? That seems odd, but I have no idea how wifi works! We're plugging them back in today so I'll check and see, but it was a concern how hot the device was. Hi, jhaygood – thanks for sharing your situation, and welcome to the eero Community! I was able to investigate your network here with a couple of my colleagues, and thankfully we can confirm that nothing looks out of the ordinary with that unit. For a bit of context about how we've designed the units, it's important to keep in mind that we have no moving parts (e.g. fans), as well as no ventilation holes or vents. The way the eeros stay cool is through the use of a special heat sink located under the top shell of the units. What this means is that if the unit is warm to the touch, then the unit is actually cooling itself effectively! While we have both physical and software safeguards in place to prevent the unit from reaching excessive heat, if you ever have any immediate concerns about the temperature of your units, we encourage you to call support directly at 877-659-2347 so we can assist directly. Thanks again for bringing your concerns to our attention, and have a great day! As a quick note to everyone in this thread, or anyone who happens upon it later down the line, I want to emphasize that calling support directly is always the best course of action for concerns or issues with your eero's thermal state. We're open 7 days a week, 9am-7pm Central, so please give us a call directly if you ever need our immediate attention on your network! Drew Ronna I had Drew diagnose the issue for me multiple times and it was always pointing to the ISP. I would call the ISP and they pointed me to the router manufacturer. 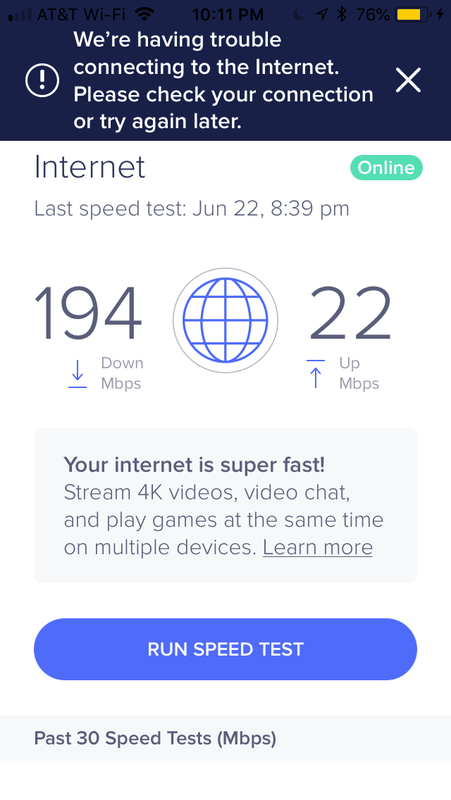 I finally got the techincal information from EERO as to why the issues is with the ISP. Long and behold, the cable outside my home had a tiny hole in it (not sure as to why) but water had gotten into the line and created major static and interference. Once they changed the cable outside my home, I have had no issues with speed and drops or manual reboots. Bottom line is my system is working well and no problems are being experienced. Mine is in the open and it is warm to the touch all times. 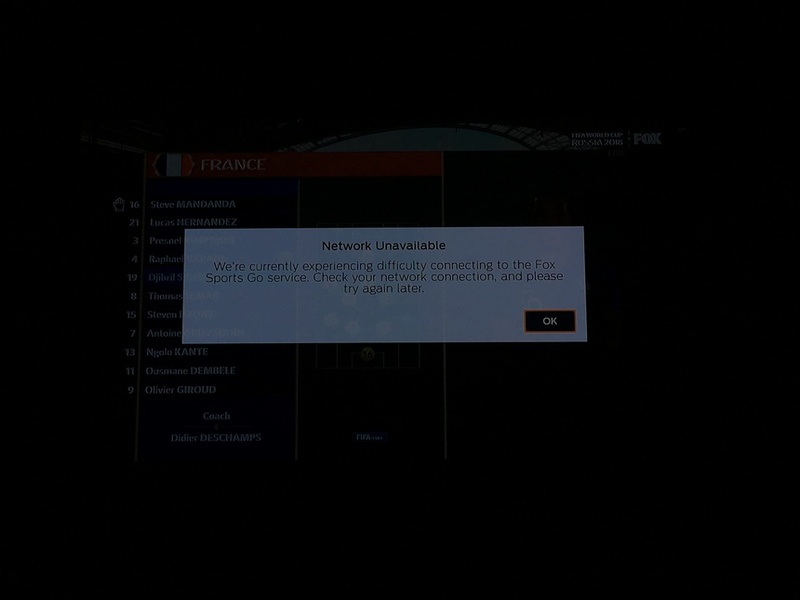 But no connection issues. I called into customer service and they were very helpful! I'm new to EEro, I replaced the Orbi RGB50 (2 pack) and it worked great without overheating. I only replaced it because of its horrible customer service, even to manualy update the firmware I would have to pay. So for that, I replaced it. Mine is way too hot too, I see that it is not just mine. My wife is in a panic over its heating and is worried it could catch on fire of burn itself out and fail. I kind of do not disagree with her on this. 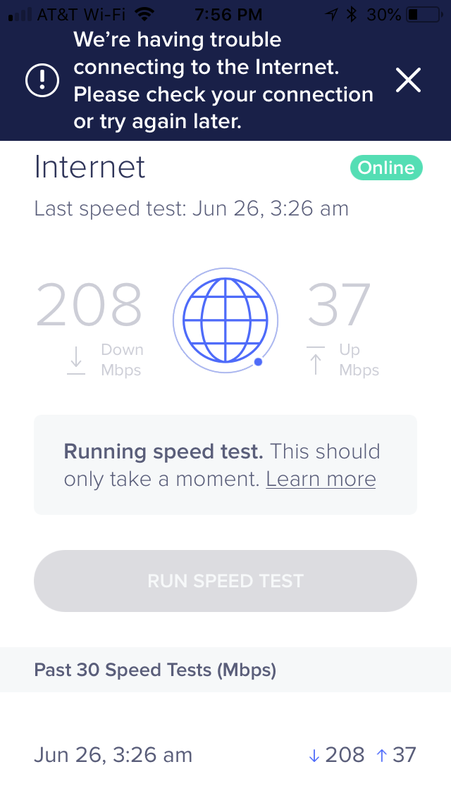 Has EERO done testing to see if this causes the drops in service I have? It sometimes says I am online and it drops, and then it says I am offline when I am online. Tim Actually EERO customer support was able to diagnose my system was slow and was having issues at the ISP level. I called my ISP and gave them hard data sent to me by Drew and they had no choice but to fix it. Had @Orbi been diligent, they would have me as a customer today. But I do not regret switching to EERO. day 10. was working great. had a arris surfboard that was overheating but not eero, replaced arris with netgear modem, now eero is getting hot but not netgear. somebody smart out there knows why this is happening. this is happening when NO ONE is logged onto the erro. help. headed back to best buy. also, twice on hold for oever 15 minutes. still have never talked to support. Sorry for the wait and for the issue you're experiencing. A member of our team should have reached out via email. We look forward to helping resolve this matter for you. Jeff C. I sent the information back to you guys. But I'm not pleased with the reason as to why there was a delayed response. I assume there is no weekend support and there are limited support staff. Very concerned as this happened to me with Luma and I replaced the Orbi system because their support was horrible, but I didn't experience this with their product. I hope to get an answer to my issue before another week goes by. The overheating is really concerning my wife a lot too! Thanks for your patience as our team has been working to get back to you. We have a full support staff and they are available on weekends. We try to get back to everyone as quickly as possible. It sounds like a member of our team is working with you at the moment. We look forward to having this resolved soon. shoeseller01 this is from last nite Jeff C. This is happening daily and multiple times a day. I cannot even restart the router remotely. If I have to constantly restart them, this is not the system for me. When this message is shown, it typically means the eero is having trouble reaching the internet. If you haven’t been experiencing issues with your ISP, please provide these details to the technician you are corresponding with via email and we can provide additional next steps. Jeff C. I sent this information via email as well. I look forward to some sort of solution. I have 30 days to return it to Best buy as I am a premium member. FYI I used a Flir temperature gun on my eeros. Max I got was 129F, with beacons running about 115-120F. Bottom part of the beacons slightly warmer than the top. Warm but not burning at all. I started the thread about 10 months ago. I must say that the overheating problem is still there. I shuffled the 3 units to avoid the main unit overheating. My concern besides the safety risks, is the performance impact as I experienced reboots from time to time. I am using the very first product units as part of the crowd funding, can someone tell me if the more recent units have the same overheating issue? Micky Tsui Jeff C. mine is also constantly hot. I went to home depot and bought an infrared thermometer to see how hot they are getting. I am getting a lot of grief from my wife to change the wifi system altogether to another company because of it. shoeseller01 What kinds of temps are you getting from your reader ? cotedan87 I am checking tonight if I get home at a decent time from work. shoeseller01 ok looking forward to hearing about the temps. Mine are in the 120-130F range and are stable. I believe the top of the eeros might be a bit warmer than the bottoms because that's the way they do heat dissipation. Jhagerty ok. That is in the norm for mine. Was in the 125-130 range here. Normal. ok. so was on hold for 45 minutes yesterday before someone answered. I was at work, Eero was at home. they had nothing to offer. not even a theory. mine is running warm to hot, shutting down once a day now while I am gone because, I think, it overheats. what I really want to know is why it is heating up if nobody is on it. does that mean there is some sort of incoming signal that is heating it up ...for that matter, is the temperature related to flow of data? I am currently bridging it through my wifi router .... so it goes axial to netgear modem to assus router to Eero modem. ha. Sorry for the wait and that we weren't able to help since you weren't by the eero. For these types of cases, the troubleshooting would require you to be present. Just like a computer or most other electronics, eeros can get warm while operating. Since eeros are fanless, the heat naturally moves to the top of the unit, safely away from the boards and other electronics. In fact, each eero has a large heat sink at the top of the unit, which is why the top of the unit may feel warmer at times. If are at all concerned with the temperature of your eeros, please email support@eero.com and provide the time when you noticed this. We'll be happy to help. If you haven't yet, please take a look at this article for more regarding this matter. Is the heat produced relative to the data being passed? If nothing is happening here, none of us are accessing the internet, can it get hot from something or someone on the outside trying to gather data? Like Echo for example? My main router eero failed to udpate 3 different times and left me without Internet. It was also hot. I had 2 eeros so swapped them. After support reviewed it, they said "I believe that a primary contributing factor to your update issues is the fact that the eero in question (XXXXXXXXXXXXXXX) is consistently throttling its own performance, presumably due to a possibly defective heat sink on the unit." I have received the new unit and it seems to run cooler. That was my experience for whatever it is worth. garp It is hard to say as I don't have the unit anymore. I primarily noticed it being very hot when it failed during updates as that was when I was handling it. I assume during updates there was high CPU usage. I'm not sure if support detected that my unit was 'throttling its own performance' during normal operations. I would suspect it would get hotter with usage, but if you aren't streaming video on multiple systems, I won't think that devices like Echo would generate enough traffic to impact the eero's temperature. garp I put a temperature sensor on it and measured 128 degrees when streaming to 3 devices. When idle, it is at 124 degrees. The sensor is sitting on top of the device in the middle. The temperature fluctuated a bit, and the correlation between streaming and non-streaming wasn't as direct as I would have thought. I just noticed that my unit is super warm, like hot! I just purchased this unit like a month ago and it doesn't seem right...what can be done? 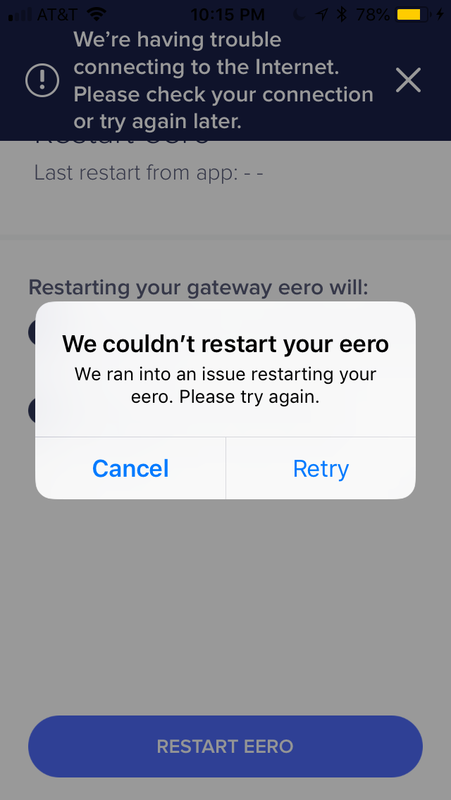 Please send a note to support@eero.com , including the reason for why you are needing to reset the modem and your eero throughout the day. Our team will be happy to help. creativejoe you can always put a fan on it. I know Eero says they're like this by design because of the heatsink, but I put a small USB fan on mine (see pic) weeks ago and have had zero issues since then. Speeds on my other two Eeros are great and stability has been rock solid with 90+ devices now connected between the three. Pictured is my gateway Eero + fan plugged into another device (a NAS unit) with a USB port since the new Eero's don't have USB ports. Steve1963 amazing how creative people get when there is a need. Jhagerty FYI Google WiFi would be my definite second choice after eero. I’ve used it and after initial hiccups (and one bad firmware auto update for which they apologized) , GWifi was solid. There is no more security built into it than eero though so not sure what you’re referring to there. Nest cams still disconnected from them but GWifi is indeed an Ok system. 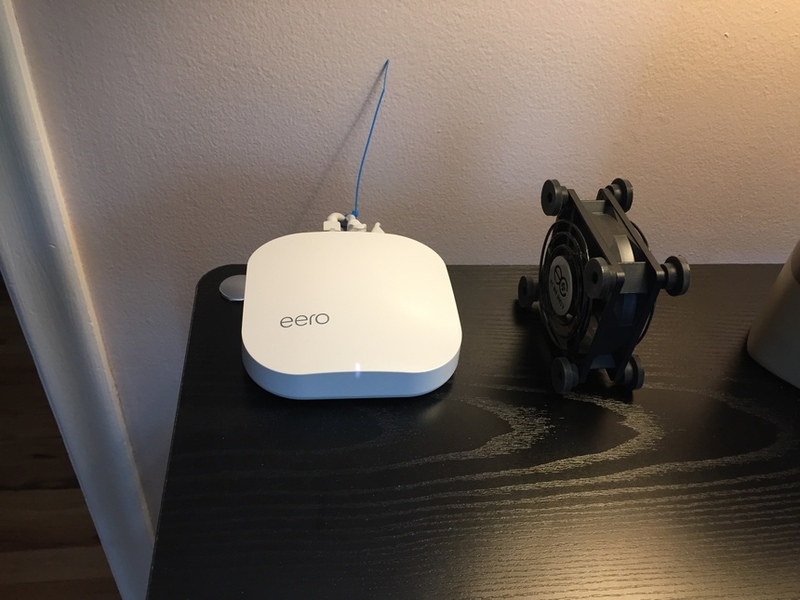 Eero is smoother and faster between eero units however. Jhagerty interesting that Google hasn’t come out with an updated GWifi model yet. It’s been over 2 years I think. My Eero continues to overheat and shut down. I am too far out to be able to return it to Bestbuy. I am going to go by small fan to see if it stops happening. I still do not understand why it is heating up, if for example, is it because so many devices are attached? frustrating. Thanks so much for taking the time to share your concerns with us, garp – I've just sent an email to you with some information on the expected temperatures of the eero, as well as a few quick questions for you so we can better understand the situation. Please take a look at your email inbox at your earliest convenience and reply directly back to my email so I can get this resolved for you as quickly as possible! As always, thanks for being a valuable member of our Community, and we look forward to hearing back from you soon! Update: I decided to give eero another shot on a second home and I am getting temps of 123/124 aimed directly at the top center with a fluke infrared gun, to be fair it was the same as the one I returned, 2 different vendors so apparently the temps are normal Drew can you provide some expected temps to everyone? Top and bottom? Keep in mind google WiFi has no moving parts either and there needs to be some sort of idea of what’s expected, the eero is kept out in the open on flat surface and that home keeps a 75 degree room temp 24/7, I bought the second set of eero at my additional home to compare and out of curiosity and although I do admit the eero does give a little better wifi speed over google: google 149 down 30 up vs eero 298 down 30 up: anything over 100 down is more than efficient to stream 4K, video game, video chat and etc, what are your temps running? Jhagerty my normal temps on 4 eeros is about 124F, and 2 beacons 120F. Even the main gateway eero stays at about 124F. 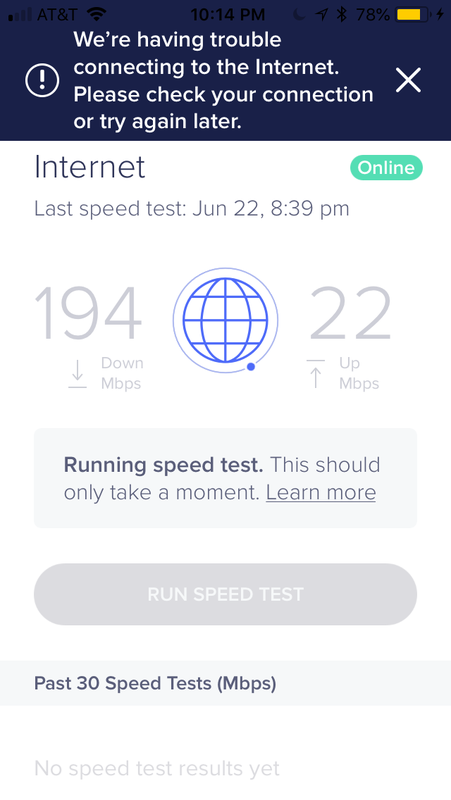 I just purchased my eero and although I have not had any connectivity issues, the temperature ranges between 117-123. The beacons average around 80 degrees. Is this normal or should I be concerned? pitti All normal. My eeros run at roughly 125 and beacons a little less. Warm to the touch but as pointed out many times in these forums, it's normal. There are sensors inside each device that monitor temp etc. pitti eero should consider adding the internal temperature under details so it can be monitored easily. I see so many inquiries about the normal temperature of the units. I suggest EERO adds the temperature reading or temp status of the units to the app. If they are within the normal range show it in green, yellow for above normal and red for shutdown prevention/restart due to heat, etc. this will aboif people like myself (when first purchased) to be made at ease and allow eero to concentrate on answering other inquiries which would be more useful if their time. shoeseller01 Completely agree and would help put this topic to bed. shoeseller01 Or even just putting some logging info in the app so those of us who want to see why a unit rebooted without having to call eero support can do so on our own! Thanks for reaching out. If you haven't yet contacted eero support, please send a message to support@eero.com so a member of our team can take a look into the issue you're experiencing. Urbanette How is the heat causing the internet to cut out? Was is the surface temperature measuring? They're normally very hot, and it isn't a problem. Eero - we get it, yes, eero units are pretty. But if people are having issues with heat, why not design them with some ventilation holes in them! Don't fall down the Apple trap of causing functional issues in your product in the endless pursuit of, say, it being 0.1 mm thinner or, in this case, not having vent holes to make it LOOK sleek but in the process making them run hotter than people are comfortable with (or that causes issues for us). I'd rather have a slightly less sleek eero unit that breathes properly and is assuredly not going to overheat than one that otherwise isn't. I appreciate all the good info on temperature measurement etc., the issue is why the eero unit rebooting or stop communicating to the internet while at the temperature it was operating at? I have replaced the main unit with the living room unit, it is working a little better but still occasional slow-down or disconnect. I am sure it will work for a while. This is not a right way to fix the problem.